Catalog Home > ACTÍVA Products, Inc. > InstaMold™, 48 oz. 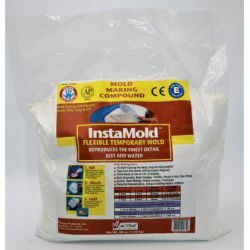 InstaMold allows you to mold the object of your choice quickly and accurately. It is non-toxic and safe for skin, and can be used on any three dimensional object. You can use InstaMold with wax, plaster, PermaStone™ and resin! InstaMold is the perfect mold-making material for craft projects such as custom-designed pottery pieces or cherished heirlooms!